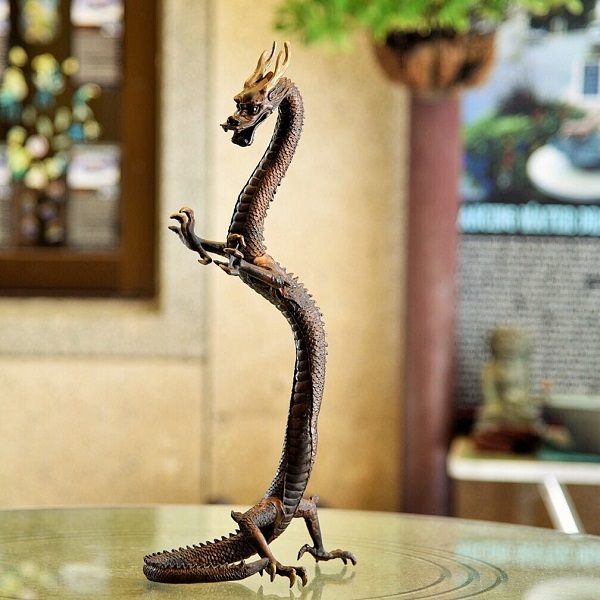 Hand finished bronze standing imperial dragon. The dragon is the historic insignia of China's most powerful man, The Emperor. The early form of the dragon was very simple in its description as seen from old drawings. However, during the Ming and Qing dynasties, the form of the dragon turned more aggressive, powerful and significant. The anatomy of the dragon became more specific and is what we see today. The dragon is made up of the head of a horse, the horns of a deer, nose of a pig, ears of a cow, body of a snake, scales of a carp and claws of an eagle. The Chinese imperial dragon that represents the Emperor will never be seen or represented walking on the ground. It is usually in the heavens or in the ocean. Only mortals walk on the ground and the Emperor is seen as above them. The imperial dragon will always be shown with a pearl which represents life, energy, authority and wealth. Colors available in brass, bronze, verdigris and black. Made to order.